After extensive research and testing, SkyGuard is the latest innovation from JLG that provides operators with enhanced control panel protection that doesn’t limit platform workspace or visibility. The control system automatically accesses the functions in use by the operator at the time of SkyGuard activation and—for a small period of time—is able to reverse that sequence, with the exception of certain functions. 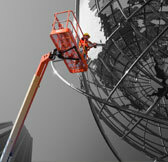 SkyGuard is just another way we’re reaching out to provide additional protection while enhancing operator productivity. Can be activated from a variety of angles. No movable parts means there’s no need for scheduled or additional maintenance. Break away feature for extreme conditions. A horn and optional blue flashing beacon alert other workers on the job site to sensor activation. 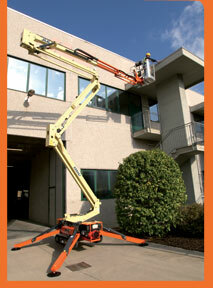 SkyGuard can be installed on combustion-powered JLG boom lifts manufactured after 2004 (not available on the 150HAX). Available for all JLG, SkyTrak® and Lull® branded telehandlers, the new 50” side shift carriage attachment allows for more precise load placement thanks to its ability to shift the carriage 4 inches from center in either direction. 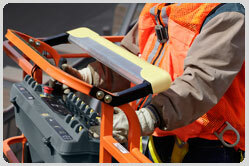 When precision load placement is required, the side shift carriage can help you hit the mark. The carriage can support up to 12,000 lb. 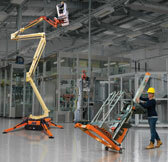 And for added convenience, it can be used with all JLG forks and approved pin-on attachments. The 50” side shift carriage can be ordered with a new machine or through your Online Express account. Reference part number 1001142790. 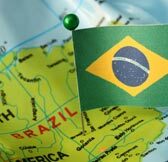 Aerial work platforms are increasing in popularity in Brazil thanks to its recently passed NRA18 regulation — an OSHA-type standard for working safely at heights. This was perfect timing since all types of access equipment were on display at the M&T Expo. One of the show’s themes, as it related to AWPs and telehandlers, was the transitioning from phase 1 to phase 2 of “Minha Casa Minha Vida” (My House My Life), which is the Brazilian government's social housing initiative for low-middle income families. Read on for the full report. International markets have been a consistent area of growth for U.S. construction equipment manufacturers. Export growth increased 24% and totaled $13.7 billion for the first half of 2012, according to the Association of Equipment Manufacturers (AEM). Regions to note include Canada, which took delivery of $4.3 billion worth of U.S.-made construction equipment, a 26% increase. South America took delivery of $2.2 billion worth of American-made construction equipment during the first half of 2012 and Central America increased its purchases 16% to total $1.1 billion. U.S. 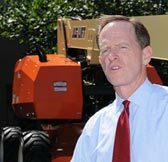 Senator Pat Toomey took a tour of JLG's facility, met with JLG staff and new President Frank Neurenhauser and even got a lift in the 860SJ boom. Available in three models with working heights ranging from 45 ft to 75 ft, JLG Compact Crawler Booms feature a tracked wheel carriage that climbs steps and a narrow chassis for access through gates, yards, standard doorways and public buildings. Be sure to visit us at the following upcoming tradeshows. We’ll be displaying and demoing new products like the Compact Crawler Booms and the LiftPod. Stop by and learn how we can help boost your business and your productivity. NSC 2012 Congress & Expo: October 22 - 24, 2012, Orlando, FL. Booth 2901. Lift and Access Showcase & Symposium: October 24 – 25, 2012, Davenport, FL. IFMA World Workplace 2012: October 31 - November 2, 2012, San Antonio, TX. Booth 782.